Hannah Kent's debut novel follows in the footsteps of Margaret Atwood's Alias Grace and Susan Fletcher's Corrag, breathing new life into the story of Agnes Magnúsdóttir, the last person to be executed in Iceland. I'm a huge fan of historical fiction centered around the lives of real people who weren't royalty or part of the aristocracy, so Burial Rites is right up my alley. 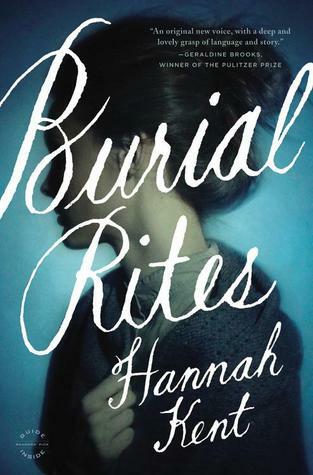 If you're a fan of slow, sad, character-driven novels then Burial Rites is for you; Kent writes shamelessly, with agonizing precision, and in doing so gives Agnes, and the people around her, vivid voices that won't soon be forgotten. Agnes is both easy to love and frustrating, but that only makes her all the more tangible; if you could only reach into the pages you might be able to touch her hair. The other characters within the novel - particularly Margret and Tóti - also crept under my skin. The relationship that developed between Agnes and Margret was my favourite within the novel; at first I was worried that Kent might develop a romance between Agnes and Tóti, which for me would have added an artificiality to the story, but instead it was Agnes and Margret who developed one of the strongest bonds, and I loved that. It's incredibly refreshing to read a book set in Iceland, and even more so to read a book set in 19th century Iceland. I loved the inclusion of the Icelandic names and phrases, and how beautifully Kent described the barren landscapes. I'm going to try and seek out more fiction set in this area of the world in future, because the majority of the historical fiction I read is set in Britain and so much of British history has already been written to death. As fun as they are, and as much as I love the period, do we really need another book set at the Tudor court? Agnes's story is as unforgiving as the landscape around her, and although this certainly isn't a cheerful read it's enjoyable all the same; there's so much feeling behind the words that you can't help but be drawn in. I adored this book, and highly recommend it. I'm so glad that you loved this book! I really did too. I agree that it's slow and sad, but the pace is part of what makes it work. I loved the historical aspects and the setting in Iceland. Great review! Thanks! =) I really did love it, it's a gorgeous book.